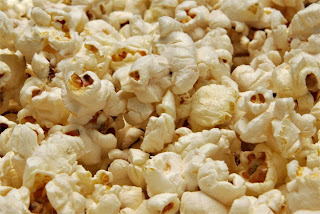 brandflakesforbreakfast: advertising kryptonite – popcorn! Research recently conducted at Cologne University has found that the act of chewing can make people immune to film advertising. According to the study published in the Journal of Consumer Psychology, “inner speech,” the subconscious activity that causes us to simulate the pronunciation of a new name when we first hear it (and later recall the name when prompted), can be disrupted by the act of chewing. Does this mean that in order to fully remember the Super Bowl ads, we should actually stay away from the guacamole? You can count us out.